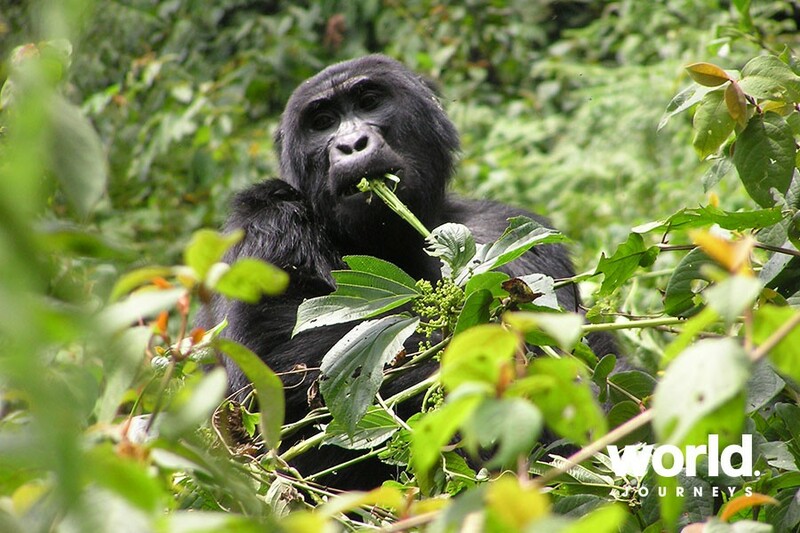 Visit the endangered mountain gorillas in Uganda's Bwindi Impenetrable Forest - a UNESCO World Heritage Site. 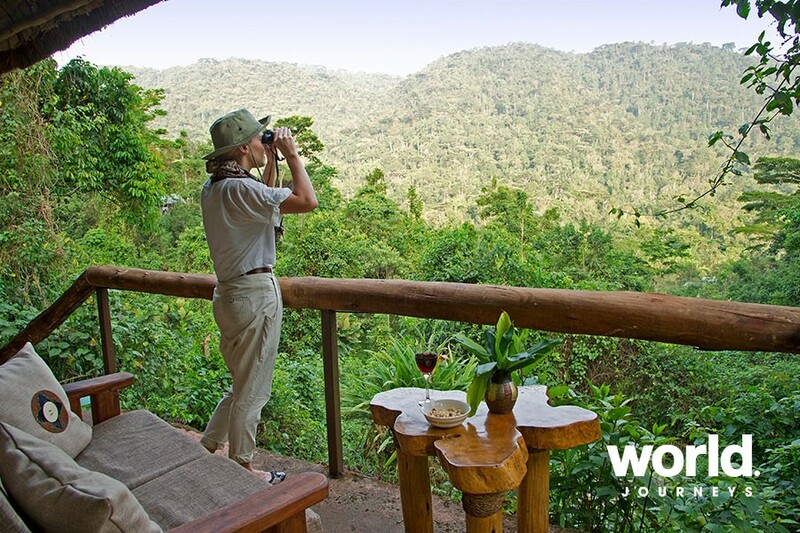 Sanctuary Gorilla Forest Camp is nestled deep inside Bwindi Impenetrable Forest; a UNESCO World Heritage Site in southwest Uganda, home to just over half the world's last surviving mountain gorillas. Trek through the ancient rainforest with expert guides gives you the chance to witness up-close the life of these fascinating primates. Nothing can quite prepare you for the thrill of encountering a family of gorillas in the wild; this is truly a once-in-a-lifetime experience that will stay with you forever. Then you will continue your once-in-a-lifetime journey to experience the best of Kenya and Tanzania in luxury and style. 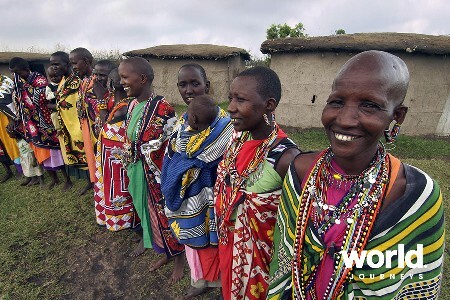 Visit the wilderness hotspots of the Masai Mara, Serengeti National Park and Ngorongoro Crater. Enjoy the stunning contrasts of these destinations and encounter a myriad of wildlife on twice daily game drives. 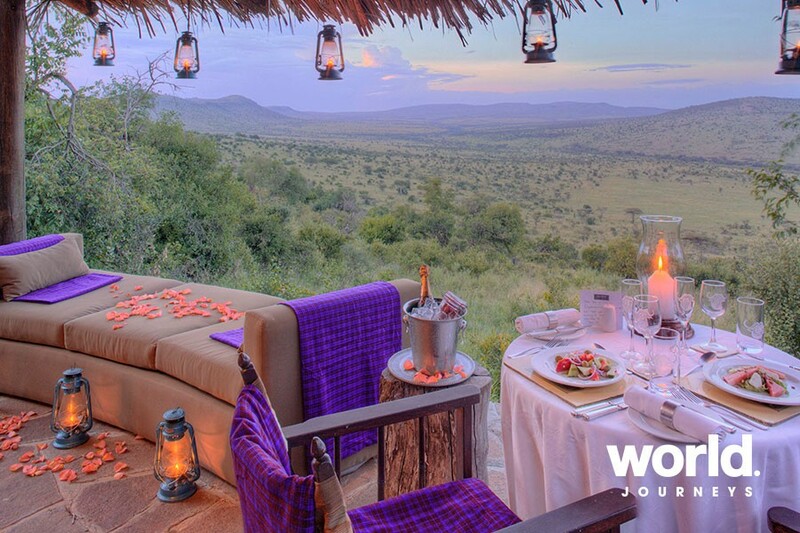 Stay at our hand-picked exclusive safari camps, flying between to maximize your time on safari. 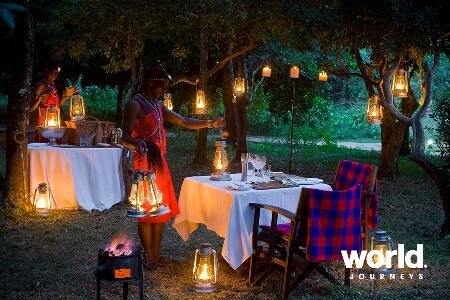 You'll be treated to exceptional cuisine and impeccable service while days are spent on exciting safaris guaranteed to fulfil your wildest dreams! Day 1: Entebbe > Bwindi Impenetrable Forest Fly to Kihihi, and road transfer to Bwindi Impenetrable Forest. Transfer to Sanctuary Gorilla Forest Camp for three nights. Days 2 & 3: Bwindi Impenetrable Forest An ancient rain forest, the Bwindi Impenetrable Forest extends over a series of steep ridges in the Virunga Volcanoes mountain range. 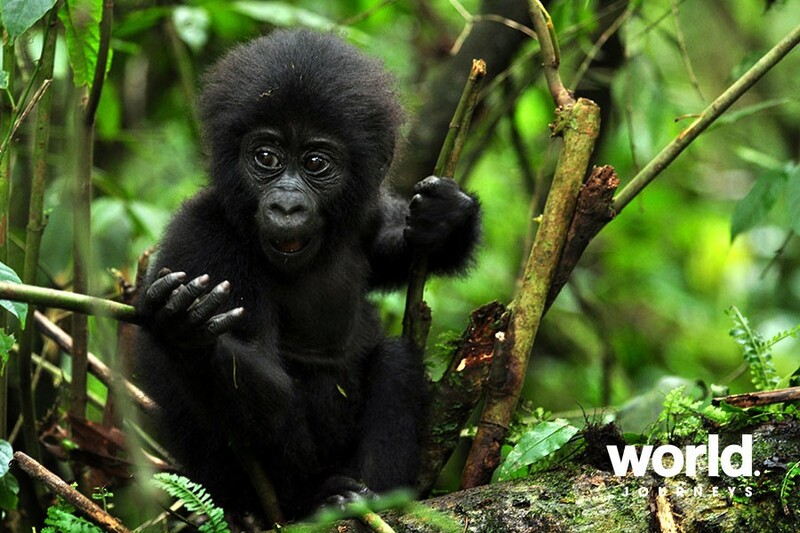 Declared a World Heritage Site due to its ecological uniqueness and biological diversity, the forest is home to roughly half of the world's total gorilla population. With terrain that varies from swamp and bamboo forest to dense thicket, this beautiful area poses both challenges and rewards for anyone interested in an intimate glimpse of the life of these fascinating primates. The gorillas you will track belong to one of the 'habituated' family groups in northern Bwindi. Experienced guides accompany the tracking, many of whom have been involved in the habituation process themselves. One population of mountain gorillas inhabits the Bwindi Impenetrable National Park in Uganda. A census in 2011 recorded over 400 gorillas here. 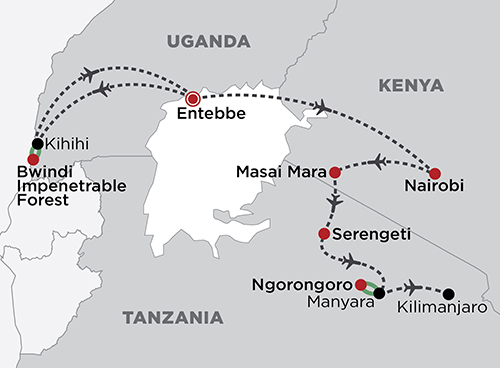 Day 4: Bwindi Impenetrable Forest > Entebbe > Nairobi Return light aircraft flight to Entebbe where you will connect to your flight to Nairobi (flight Entebbe > Nairobi not included). Day 5: Nairobi > Masai Mara Fly from Nairobi to the Masai Mara - Kenya's most renowned game park and legendary for great sightings of wildlife year-round, for two nights at the intimate and vintage safari style of Bateleur Camp overlooking where the final scene in Out of Africa was filmed. 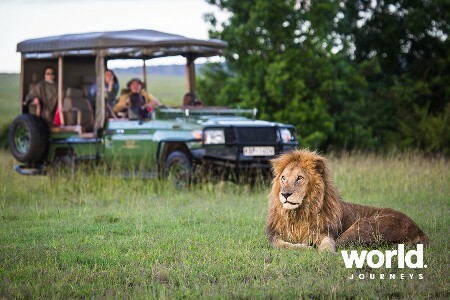 Enjoy game drives with expert guides in open 4x4 vehicles with guaranteed "window seats" and uninterrupted views. Day 6: Masai Mara Game Reserve Take thrilling morning and afternoon game drives to spot the Big Five. Enjoy views of the Mara from the pool and lounge area at camp. The migratory wildebeest, zebra, kongoni and topi join abundant elephant, hippo, buffalo, giraffe, lion and cheetah. Leopard and serval are frequently encountered, while endangered black rhino can be found in the dense bush thickets. Day 7: Masai Mara > Serengeti National Park Fly to the Serengeti, undoubtedly one of the world's most celebrated wilderness areas. 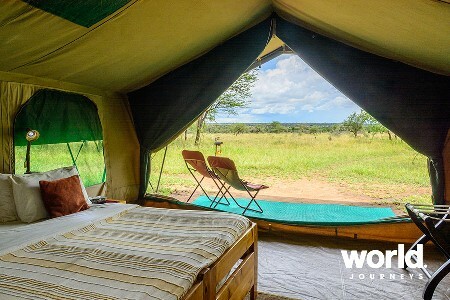 Spend three nights at andBeyond Grumeti Serengeti Tented Camp, or andBeyond Kleins Camp, or andBeyond Serengeti Under Canvas. 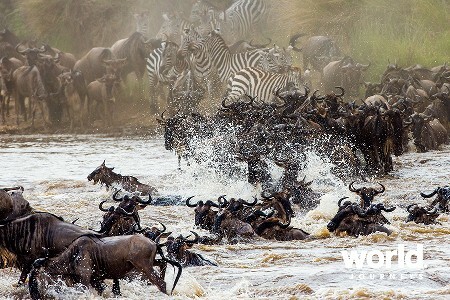 Days 8 & 9: Serengeti National Park Every day is different, with twice-daily or full day safari depending on the season. 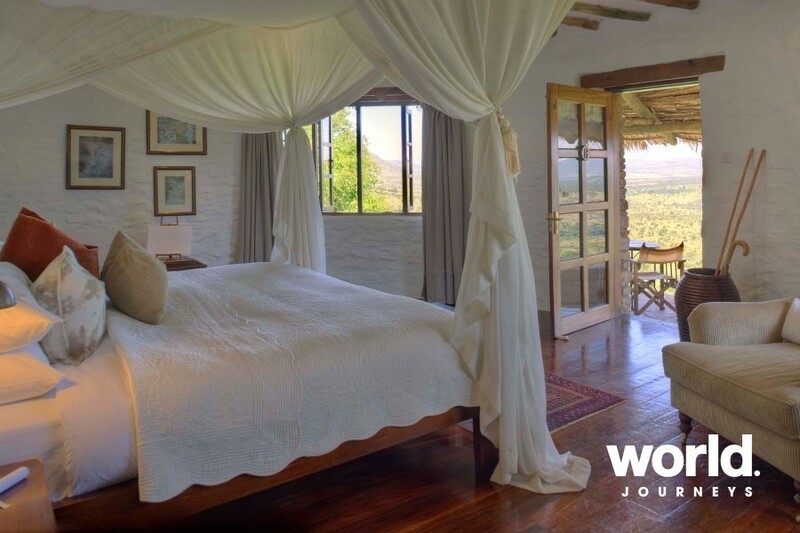 Head out after breakfast and return for lunch and siesta at camp and then a late afternoon safari ending in sundowners under African skies; or go on a full-day migration safari with a hearty picnic lunch, returning to camp to relax in the evening. A balloon safari (optional) over the Serengeti is a highly recommended option. With no fences or man-made barriers, huge numbers of wildlife move freely throughout this area, constantly recreating an ageless natural cycle. 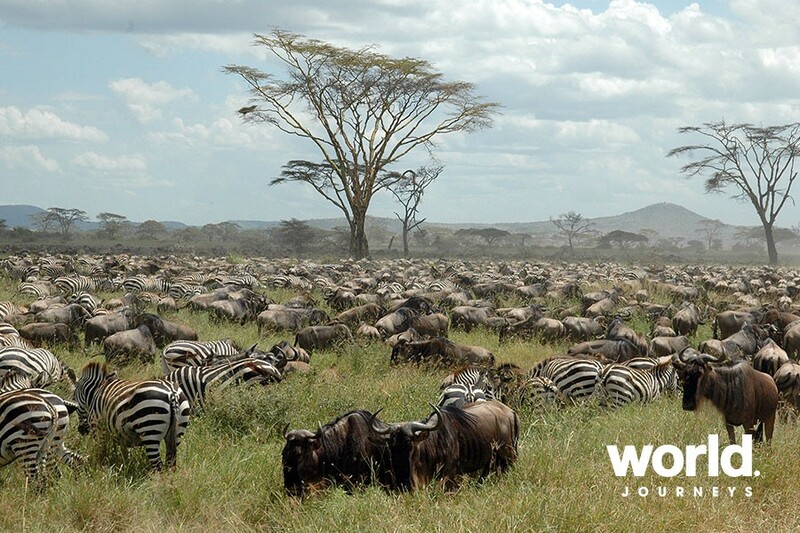 The magnificent Serengeti is famed for its vast tree-less grasslands, allowing for excellent wildlife sightings. Day 10: Serengeti > Ngorongoro Crater Fly to Manyara and spend two nights near the Crater at the iconic andBeyond Ngorongoro Crater Lodge, perched on the rim of the crater with magnificent views. Steeped in romance, each stilted, handcrafted mud and thatch suite is adorned with graceful antiques. Ensuite bathrooms, with a centrepiece of fresh roses, feature huge showers and chandelier-lit bathtubs, while floor-to-ceiling windows ensure breathtaking views from everywhere. Day 11: Ngorongoro Crater Spend the day in the Ngorongoro Crater - this ancient volcano shelters more than 30,000 protected animals. 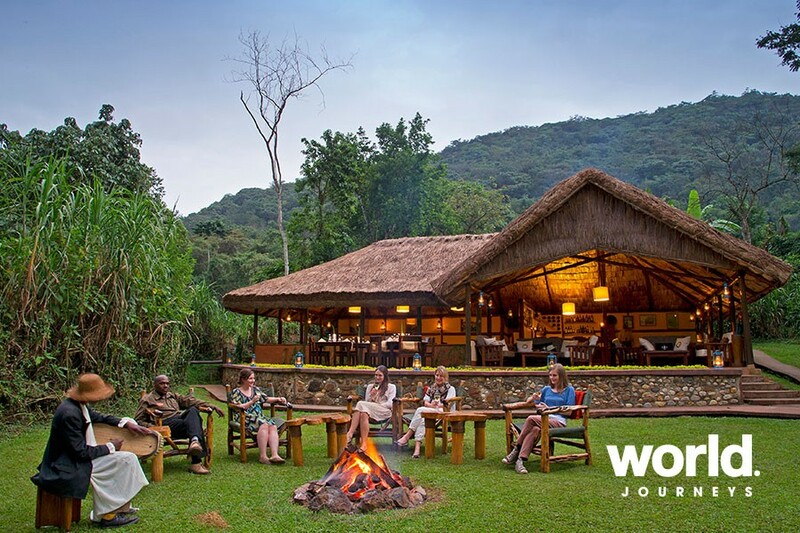 Stop for a picnic on the Crater floor - surrounded by some of Africa's most iconic scenery, as well as masses of wildlife, the appetite is sharpened and the taste buds awakened. Continue on your wildlife adventure after lunch, returning to the Lodge in the early afternoon. Day 12: Ngorongoro Crater > Manyara > Kilimanjaro Transfer to Manyara Airstrip for your light aircraft transfer to Kilimanjaro. NB: Gorilla trek fees are additional and subject to change. In order to book, the cost of the trek fee is payable and non-refundable (US$600 per person per trek). Park fees (variable) must be added at time of booking. Current park fees: Masai Mara US$80 per person per day; Serengeti US$60 per person per day; Ngorongoro Crater USD$60 park fee and US$85 Crater fee per person per day; Manyara US$45 per person per day. Single price is based on a single supplement when travelling with others. Solo single travel pricing is available on request. You must be over 15 years of age to obtain a gorilla viewing permit. We recommend an optional Balloon Safari over the Masai Mara or Serengeti - contact us for prices. Pricing is for travel within the specified dates. Should travel cross into two different seasons a reprice will be given for actual dates. National Park Fees and Airport Taxes are not included and will be added at the current rates (subject to change). Park fees in Kenya and Tanzania are not included. Gorilla permits not included: add US$600 per trek.